Located in the Lake Norman area, we are a shopping destination for the avid Antique & Vintage Collector, as well as for interior designers & do-it-yourself decorators ! Welcome to the Ain't Too Shabby Shop . . . Convenient to Charlotte and surrounding Lake Norman Communities, the Ain't Too Shabby Shop is located at the Oak Street Mill Antiques Mall at 19725 Oak Street in Cornelius, NC 28031. Our shop location is in the first two rooms on the left as you enter Oak Street Mill and an additional booth on the main aisle far right towards the back of the mill. Easy access just off Exit 28 from I-77. Here you will find one of the best kept secret shopping destinations for the avid Antique and Vintage Collector, as well as for interior designers and do-it-yourself decorators! 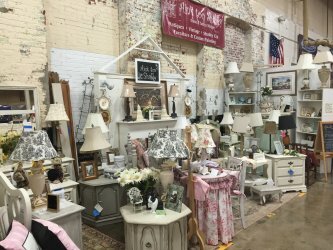 The Oak Street Mill Antiques Mall has over 150 vendors. . . . An Antique and Vintage Furniture Collector's haven! A treasure trove full of interesting artifacts and fabulous finds from days gone by . . . a decorators dream! Amidst this shopping mecca, you will find the Ain't Too Shabby Shop . . . a unique shopping experience in itself. An emporium full of Antiques and Vintage furniture, home accessories and so much more! We offer several different categories of merchandise for shopping . . . all within one shop, each category complementing the other. You can come in to shop for fine Antiques and Vintage furniture, home accessories for the home and garden. You can also find some wonderful items to indulge yourself into or buy fine gifts for your friends and family. Visit the following while you are in Ain't Too Shabby Shop . . .
Home Furnishings & Accessories . . . From the 1800's to the 1960's . . . fine furniture at very affordable prices. Featuring "Shabby Chic and Cottage Styles” . . . Beds & Headboards, Dressers, Mirrors, Armoires, Chiffarobes, Night Stands, Accent Tables and Chairs. Dining Tables, Chairs, China Cabinets, Sideboards, Servers, Buffets, Chandeliers, Lamps, Mirrors and Accessories Galore! All different sizes, finishes colors and styles . . . specializing in Vintage and Custom Painting Services Offered. Many collectables are also available such as china, crystal, figurines, pottery and glass, silver and brassware. New items arrive daily so you never know what great treasures await you! Offering a wide variety of delicious fresh made Soups, Salads, Quiche, Sandwiches, Desserts and Pastries ... plus we offer special Tea Party Service daily such as our Cream Tea, Light Tea, Luncheon Tea and a full service High Tea. Reservations are recommended for teas ... Call (7040 641-2201 to reserve your table. Catering , Special order Desserts and party Trays, and our Cafe is the perfect venue for your private parties, Bridal and baby Showers, Birthday Party Celebrations and Group Meetings or Parties. Call our Event Planner for further Information (704) 641-2201. THE SECRET GARDENS . . . we carry a nice selection of garden themed items featuring home furnishings, outdoor and indoor garden accessories and decor. Wreaths, floral arrangements, baskets and metal works, birdhouses, bird baths, flower pots, benches, and some garden statuary too! Watch for our new market arrivals coming soon! These items are available only seasonally. Many of the vintage furniture items in the store are in their original finish. We offer Custom Painting and finishing on most of our furniture pieces. Select a color to match your decor, we will do the rest. Distressed, Heirloom and Vintage finishes are our specialty. You never know what you may discover at the Ain't Too Shabby Shop . . . it's always a shopping adventure! Come visit us today . . . you will find it may become one of your most favorite places to shop! We thank you for looking and look forward to seeing you soon!